With the 714XA automated tabletop folder, Baum continues the tradition of providing the most reliable and rugged folder in a compact and convenient design. 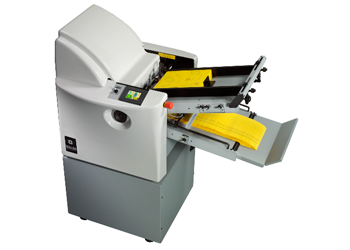 The BAUM 714XA offers all of the rugged features of the popular manual setup BAUM 714XLT folder and then adds automation and state-of-the-art features to meet today’s demanding needs along with modern styling. This automated tabletop folder provides reliability, durability and speed in a compact and convenient design. Feed table extension that can handle longer sheet lengths, enabling tri-folding of 25.5″ long sheets from brochures, etc.